South Korea’s subtly calibrated risk aversion in the face of outrageous North Korean aggression has kept the two countries from war. The idea the world is sleepwalking to war, much like Europe did in the early years of the 20th century, deserves to be taken seriously. One of us (Chris Barrie) set the hares running recently when he said that, as in 1914, political leaders today are doing just that. Barrie was following the lead of eminent historians like Margaret MacMillan and Christopher Clark, who concluded that Europe did sleepwalk into the first world war – even if they are at a loss to explain why. MacMillan, like Barrie, has pointed out the “disquieting parallels with the present”. But the problem with history is that it is always easy to gainsay such parallels. History doesn’t repeat itself – at least not in an exact way. The parallels that exist are usually at such a high level of abstraction that small shifts in local circumstances can render them useless. History’s problem is the problem of the dynamics of all complex systems. Their futures are not determined, yet nor are they random. At any given point in time, the next step for any complex system exists as many possibilities – some of which are much more likely to occur than others. Complex systems thinking offers another approach to examine the parallels between today and the early 20th century. We can look forward with a complex systems perspective to seek the many possible futures, and then ask the question: which is the most likely? We can do this through simulation. In this case, we need a model of the strategic interactions between countries that is sufficiently general that both the model and the real world are similar complex systems. And we need a model that is sufficiently realistic that its behaviours are easily recognisable in the real world of strategic interaction. Until about 20 or 30 years ago, simulations of complex systems were pretty clunky and unrealistic. With advances in complex systems science, we can now build models that meet both criteria – generality and realism. In this vein, we (Roger and Dmitry) have been building a general simulation framework that models the strategic interactions between countries. In discussion with Chris, we created a model within that framework that explores the essence of the sleepwalking hypothesis. 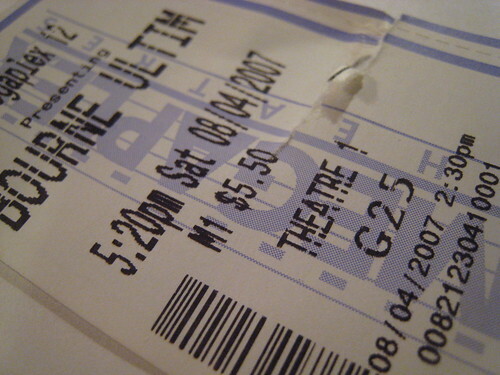 What we found broadly confirmed the hypothesis – but added some surprising wrinkles of its own. The model stripped the problem to its essentials – a set of countries that interact with each other through competition (at its extreme, war) and co-operation (at its extreme, peace). Countries can grow in wealth and power through these interactions. But there are costs imposed (especially by war) even on winners, so countries can also decline in wealth and power. Countries choose how to interact with a strategy they develop from their past experience and from observing what works for their neighbours. For the sleepwalking hypothesis, we focused on two parameters that are part of a country’s strategy – hawkishness and risk aversion. There is evidence of hawkishness in the rise in nationalism within countries as they adopt more aggressive postures in their international relations. In recent years, hawkishness has been growing in China, Russia, North Korea and the US. An aggressive posture is one thing – but doing something about it is another, as countries factor in the costs and risks of aggression. So, we see risk aversion as a parameter distinct from hawkishness. Saudi Arabia has demonstrated less risk aversion combined with high hawkishness in its Yemen excursions – as have Turkey and Iran in their Syrian adventure. 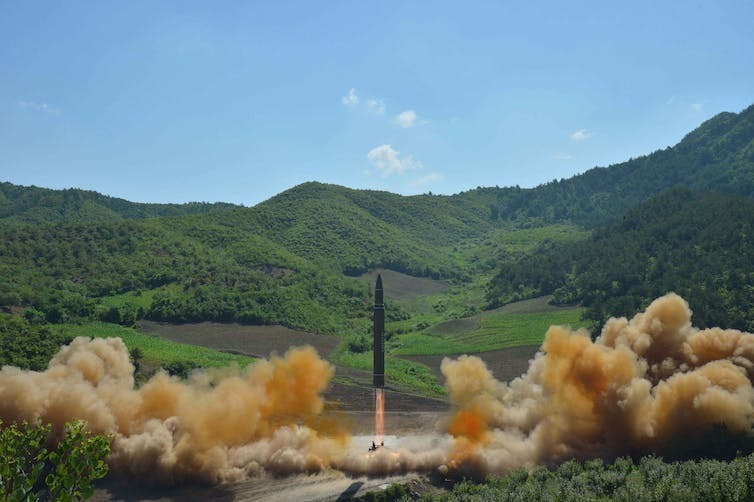 But they also can be decoupled – North and South Korea are both pretty hawkish, but South Korea’s subtly calibrated risk aversion in the face of outrageous North Korean aggression has kept the two countries from war. For instance, in 2010, a North Korean submarine, in an unprovoked attack, sank the South Korean corvette Cheonan. South Korea kept its response to the diplomatic domain. We hypothesised that the world sleepwalks to war when hawkishness rises to high levels and risk aversion falls to low levels across the ensemble of states. 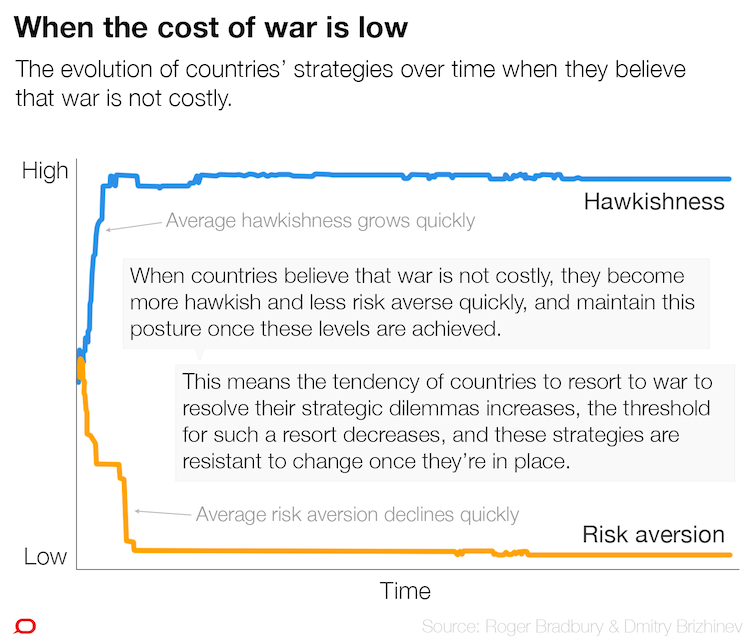 The interactive below shows the evolution of countries’ strategies when they believe war is not costly (whether it is or not), and when they have a tendency to copy other countries’ successful strategies. We see that hawkishness grows very quickly and risk aversion declines very quickly across the whole ensemble. We also see that these strategies are very stable once achieved. When successful, the willingness of countries to resort to war to resolve their strategic dilemmas increases, the threshold for such a resort decreases, and this willingness is resistant to change once it is in place. The model clearly confirms the hypothesis. But is a de-escalation path available once the ensemble of countries is locked into high hawkishness and low risk aversion, and just waiting for a trigger for a major conflict? Because of the in-step nature of “sleepwalking to war”, we wondered if explicit policy action by individual countries could carve out a de-escalation path. So, we drilled down into the behaviour of pairs of countries to see if we could visualise paths from war to peace. Here we modelled, for a pair of countries, the most likely regions of war, peace and stand-off in their interactions for different degrees of hawkishness for each. We added the idea of a stand-off to our model to account for the “not-peace, not-war” phenomenon observed, for example, during the Cold War. We then tracked the evolution of that landscape as risk aversion increased, as shown below. We can see clearly that increased hawkishness alone will not lead to war unless risk aversion is also low. When risk aversion is high, there is plenty of peaceful space available even in the highly hawkish parts of the landscape. In the Cold War, even though both sides mirrored each other in highly hawkish ways, their mutual risk aversion actually created a long, if tense, peace – a stand-off. And statesmanship on both sides continually steered the strategies towards the more peaceful parts of the landscape. But we can also see that the peaceful domain in the landscape shrinks rapidly as risk aversion decreases, such that, at low risk aversion, even low levels of hawkishness can drive countries to war. Taking both sets of results together, we think that, in walking countries away from war, statesmanship might find much more purchase on risk aversion than on hawkishness. It seems hawkishness is more about values (as seen, for example, in emotional calls to nationalism and populism). Risk aversion, by contrast, seems more about the rational balance of war’s costs and benefits. With hawkishness strongly influenced by the behaviours of other countries, it is easier to talk it up than down. And, with high emotional content, it’s likely to be resistant to statesmanship – that is, policy actions that go against the grain of the moment. But risk aversion, as a rational action, depends to a significant degree on a country’s internal policy environment – how its citizens feel about the costs of war – and so may be more amenable to change. In an increasingly hawkish world, this may be our best bet for maintaining peace. In what can only be described as a novel approach to employment, Jacqueline Samuel has turned hugging into a business. What other ‘odd’ and ‘crazy’ ideas can be turned into a business – I’m sure someone out there is thinking about doing it if they haven’t already done so.